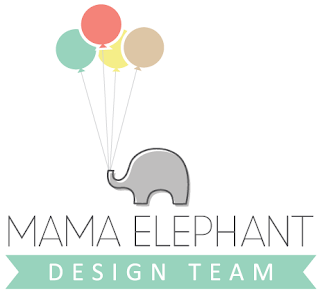 So now that the Mama Elephant DT has been revealed, we can get to sharing our release projects! Over the next week and a half, we will be highlighting each set one by one. Today, the DT's is showcasing We Click ! This set was so much fun to work with and I just *know* this set will see a lot of ink! For my project, I decided to go with a shaker card using the polaroid frame. I cut the inside of the frame with an xacto knife (super easy) and lined it with acetate. The shaker part is filled with coarse glitter, silver glitter, and punched cardstock hearts. 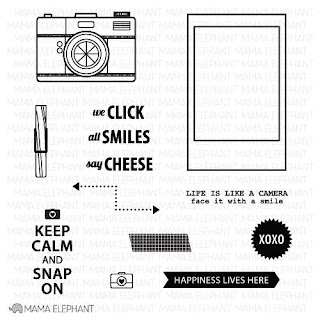 I also knew that I wanted to use that fabulous camera stamp! 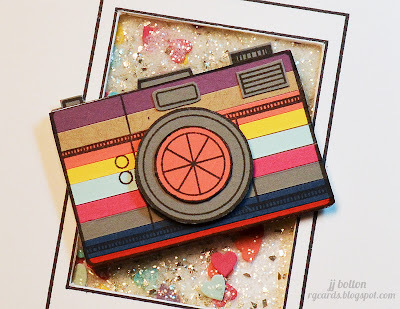 That's probably my favorite stamp in the set:) I put together strips of different colored papers, stamped the camera over the strips, then paper-pieced some of the various doodads (I'm pretty sure "doodads" is the correct technical term ;). Too...much...fun. Oh wow, too pretty, JJ. So. Darn. Cute! 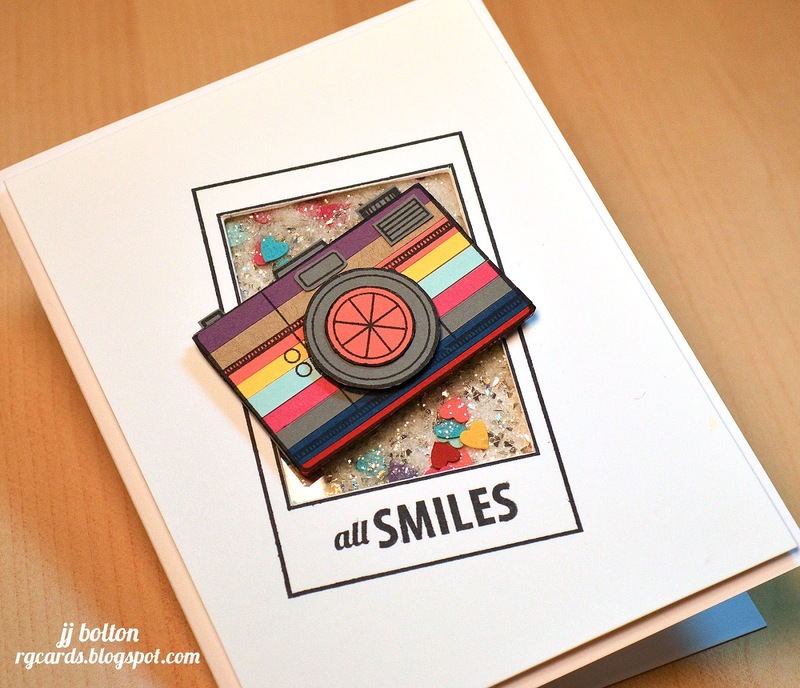 Love that striped camera and the shaker Polaroid rocks! Very cool card JJ, great colours and that shaker is amazing! Such a fun card, love the shaker! I LOOOOOOOOOOVE that camera--I love the different colors you've used! And what a fun shaker card! I must try this again soon:) FAB all around!!! ADORBS! Loving the glittery sparkly fluffy stuff behind the camera! Too cute. Love the shaker. Doodads is the exact technical term :) LOVE the dimension with the camera, and I haven't made a shaker in ages - I must pull out some acetate! Love it! love that you made a shaker card! super duper fun! Gorgeous!! I love the shaker in the background!! uber cool shaker card, JJ! your striped camera is awesome, too! Totally awesome as usual! Love this card! LOVE LOVE LOVE LOVE!!!!! That is all. JJ I love the shaker box and the colorful striped camera - picture perfect... get it? haha! I know I gotta try harder don't I?? This is gorgeous! I just love the heart confetti and glitter in the shaker! !